Odyssey is no stranger to success, especially when it comes to travel equipment and this drive and just proves the point further. The Odyssey Waterproof Dry Bag is not only cost efficient but very attractive in appearance. As far as effectiveness is concerned, the high ratings prove the value for money aspect of this dry bag that is unbeatable! If you belong to the scuba team or have recently started going on expeditions, then you would need quality dry bags. These dry bags are unlike anything that you have ever seen till recently. The Odyssey Dry Bags are of superior quality and they rank among the top ten bags from around the world. Users are satisfied with the quality of service that these strong round bottom bags are giving to the travelers. These roll over top sacks are dry and they shall keep all your contents, including high end electronics safe even as you go diving or scuba diving, or even on a fishing expedition. Those who are going on fishing or kayaking trip might still need to carry along food, clothes, medicines, and of course, electronics from power banks to cameras. It is highly likely that water might get in to any of these if you are just carrying some normal fabric sack or bag. This is why from the earliest times; people are going for using oil cloth, leather, or rubberized bags or sacks. But thanks to modern technology, lightweight materials are in use and they even are waterproof to protect water from entering the bags. Striking design and quality: The tarpaulin material is going to be light and of the finest quality with 500-denier. This is the reason the bag is perfect for adventure enthusiasts. The stylish look and the 10L capacity is ideal for those who do not really want a big bulky bag to lug around. Shoulder straps for easy handling: The busy traveler, the wanderlust traveler, would not be careful or laid back when he is aiming to reach his destination. As a traveler on the go, I do not like too many zips, or too much of knots and locks. I just prefer to throw the bag over my shoulder and this is why I like to have the shoulder straps strong. The shoulder straps are adjustable too for maximum comfort. Waterproof bodies: The waterproof body is the best attribute of the Odyssey Dry Bag and they shall be able to protect the contents from UV rays, sun, salt, sand and water. Traveling even in the rainy season shall not be a problem anymore. This guarantee is one of the big plus for those who do not have time to wait for a more suitable season to travel. Carry water or wash with ease: Odyssey Dry Bags shall be perfect for carrying water from the nearest river, or stream to the campsite with ease. There is no problem carrying water with the bag. We tried to use it for washing our clothes in our campsite. Chosen by top professional divers: One more striking feature about the Odyssey Dry Bag is that the bag is also of top choice of divers. The divers who shall go for the professional expeditions shall be able to use these for their trips with ease. Sizes: The Odyssey Dry Bag comes in 10L size which is perfect to go for camping or hiking trip for a weekend. Compress and pack in your clothes, diary, camera, and take the trip to your dream weekend getaway! The 20L bag is perfect for those who wish to pack for two in a single bag for a hassle free trip.Travel light for your next snorkeling trip. Dimensions: The bags have 12 inches of opening on the top for packing in clothes. Do not worry about water entering, since all that you would have to do is just snap, and align through the seam and roll over thrice for a watertight bag before you step out on a rainy day. Smart Pouch: One more accessory that this Odyssey brand has come up with for the travelers is to help them with a smartphone pouch. The see-through pouch for the smartphone allows you to view the callers without even removing it from the pouch on a rainy day. This saves the smartphone from dust, sand or other pollution including moisture. 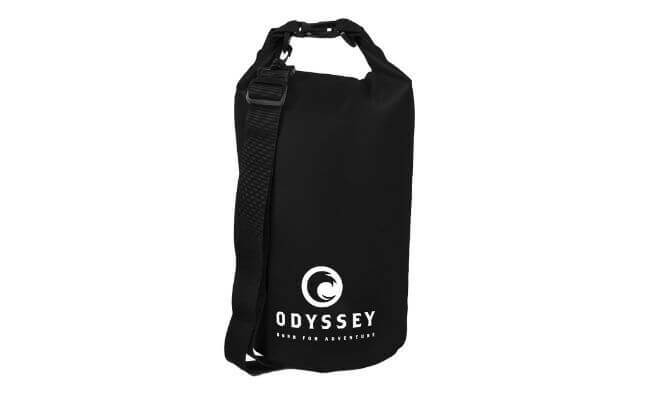 This dry bag by Odyssey is highly popular on Amazon.com and has a rating of over 4.5/5 stars and over 660 customer reviews. This alone should be sufficient evidence proving the fact that the dry bag is more than worthy of purchasing. Take a look at the reviews it for yourself and be the judge. While this dry bag product might be one of the best in the industry, we sure would have liked to test out a bigger variant. The 10 L and 20 L variant may be insufficient for frequent travelers, but then again they have the choice of buying more than one item if need be. 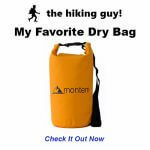 Go back and read more ﻿dry bag﻿ ﻿reviews﻿! The Odyssey Dry bag comes in black and orange colors and if you too love either of these colors, carry it, flaunt it, while you go on your next trip. The bag is available at affordable price from Amazon.com and the there is perhaps no better place to buy it reliably, without even stepping out of your home. So go ahead and make the purchase; we guarantee you won’t be disappointed. I am a lover of the great outdoors and nature. I have finished climbing the Trailwrights 72, and have done two coast-to-coast backpacking trips across the Scottish Highlands, in the 2016 and 2017 TGO Challenges. thehikingguy.com is a participant in the Amazon Services LLC Associates Program, an affiliate advertising program designed to provide a means for sites to earn advertising fees by advertising and linking to Amazon.com. Additionally, thehikingguy.com participates in various other affiliate programs, and we sometimes get a commission through purchases made through our links. Copyright 2016 by The Hiking Guy. Sign up below to enter our ﻿monthly﻿ giveaway. You will need to send us your ﻿size﻿ if you win!